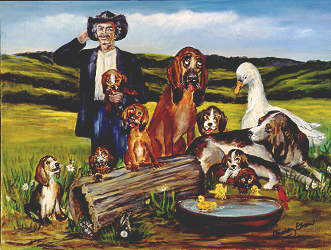 Buddy Ebsen's Uncle Jed Country - "Welll Doggies"
Welll Doggies is Uncle Jed's unique expression of pleasant surprise, known worldwide as a friendly hello. In this painting the pleasant suprise is flavored with ambivalent concern at the size of Duke's burgeoning family. Duke's soul mate Dixie and her puppies are learning about sharing their food and water with uninvited guests. Mother goose is a concerned lifeguard.